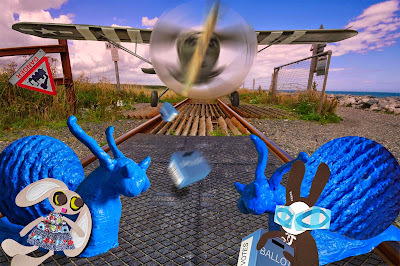 The Wabbit thought it was a plane and it was. An old turbo prop swept low along the lines and they all took cover. But just as it reached the MoTo snails, it swooped upwards with a deafening roar and blue boxes spiralled onto the track. The Wabbit grabbed one and inspected it. "These are ballot boxes," said Lapinette. The Wabbit was puzzled. "Maybe they're the missing votes." The turbo prop disappeared out to sea, leaving only the sounds of waves moving shingle on the beach and rustling of paper. "What missing votes?" asked To, who was old school and critical. "There were strange stories from my land," said the Wabbit. "Tales of remote polling stations and ballot boxes and jeeps in the night." "I remember," said Lapinette. "It was in La Stampa." "We hate newspapers," said Mo. To agreed. "They're not worth the paper they're written on." "Like votes," said Mo. To laughed. "They give you a box and some stuff and you have to put the stuff in their box." "Sometimes that's true," said the Wabbit sadly. He shook the box and heard something scratching. So he peered through the slit but saw only paper. "All the same," said Lapinette, "votes shouldn't just disappear." "They didn't disappear," said Mo, "they were redistributed." The Wabbit shook his head like a donkey. "We need to look at them, but oh, why didn't they land in the sea instead?" Lapinette blinked and winked. "They would have been floating votes ..."